Nappy Cakes - One stop shop for kids clothes and gifts for all occasions. 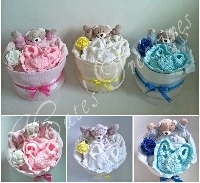 All my Nappy Cakes and Baby Gifts are made with love, care and high attention to the detail. If you would like to order a Baby Gift that's not available in the shop at the moment please use the contact form to discuss your order with me. You can see the gallery or visit my facebook page [here] to see other ideas I have created in the past. Thank you and I'm very sorry for any inconvenience.